Claire Eccles steps in front of the mound for a couple of easy tosses before signalling she's ready to pitch. The catcher prepares for the delivery, neither really knowing where her knuckleball is headed. "It's dancing!" the catcher blurts out after snagging the ball that dipped sharply before returning it to Eccles. She flashes a quick smile and heads back to the rubber. A member of both the UBC Thunderbirds softball team and the Canadian women's baseball team, that knuckleball is why Eccles will be wearing another hat this summer after the Victoria HarbourCats announced Tuesday that the 19-year-old from Surrey, B.C., has joined the club for the 2017 West Coast League season. Eccles will be the first female to compete in the 11-team circuit that's home to mostly men's university players from the United States and Canada, including some who have been drafted by major league clubs. She will also be the first Canadian woman to suit up at this level. Eccles, 19, grew up in Surrey. "A 100 per cent Claire is good enough to play on our team," said HarbourCats general manager Brad Norris-Jones. "Is it going to be a challenge for Claire? Absolutely. "We're just going to get everyone involved and show that in 2017, this isn't different. This isn't weird. It's normal." Eccles, who has a baseball subtly tattooed behind her right ear, was intrigued when Norris-Jones first reached out. But the left-hander, who also throws a two-seam fastball and a curve, wanted to make sure she would be getting a real shot. "I was obviously a little skeptical," she said. "You have to wonder: 'Is this just for their own publicity?' Brad said I'd get fair opportunities and it's not just for show." Like many knuckleballers, Eccles fell into the pitch almost by accident. "All the kids would try and throw a knuckleball," she said. "I played around with it and it eventually turned into something I could use." "If we strictly went on her velocity, I don't think she could compete at this level," said Norris-Jones. "But her knuckleball definitely competes at this level." Eccles' fastball tops out at around 76 m.p.h. — for comparison, major-leaguers regularly throw in the 90s — but the knuckleball is more about minimizing spin than maximizing speed. The pitch is tricky for batters to read because of the ball's erratic movement. Eccles counts Ichiro Suzuki as her sporting idol and played on boys' teams until Grade 8 when her parents made her switch to softball. Growing up her goal was to play in the major leagues. Not wanting their daughter's hopes to get too high, her mom explained that wasn't possible. "I don't think she was trying to crush my dreams," said Eccles. "She was just trying to be more realistic." 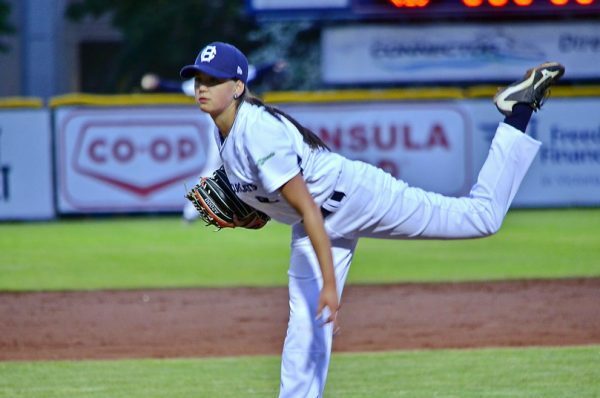 Playing for the HarbourCats wasn't what she ended up setting her sights on, but now that the opportunity is here, she plans on making the most of it on the field and as a role model. "I want to get it out there that girls can play baseball," she said. "Hopefully this paves the way for other girls in the future."